Each student is responsible for the proper completion of her academic program as based on the requirements stated in the College Catalog. The assigned faculty advisor is available for consultation, but responsibility remains with the student. Additional advising assistance is available through the Bennett College Center Institute for Academic Success. Each student has the right to expect Bennett College to conduct its business and programs in accordance with the highest ethical, moral, and legal standards. In identifying the ethical and moral standards to be followed by the College, one need only refer to the basic principles and standards presented in the New Testament of the Bible. Bennett is a Christian institution, and it will maintain the highest standards of Christian ethics and morality in dealing with students. Individualism is paramount to an understanding of the ethical standards of Bennett College. Each student is considered a unique individual, divinely created, and capable of becoming better each day. Students are expected to attend all scheduled classes and to be in touch with their professors when an unavoidable absence occurs. Regardless of their other activities, students are responsible for completing all course requirements on time and to the best of their abilities. Furthermore, students are expected to adhere to the highest standards of academic integrity, including the appropriate use and citation of the work and ideas of others. The minimum standard for satisfactory academic standing for all Bennett College students is a 2.0 (C) cumulative grade point average. A student with less than the required 2.0 grade point average at the end of her first semester will automatically be given an “Academic Warning.” A student with less than a 2.0 cumulative grade point average at the end of her second semester will automatically be placed on “Academic Probation.” A student with less than a 2.0 cumulative grade point average at the end of her third semester will be automatically “Dismissed” whether or not she has been previously placed on academic warning or probation. An academically dismissed student may petition for readmission to the College. If a student has been academically dismissed from the College twice, she becomes ineligible to apply for readmission to Bennett College for a period of three (3) years. 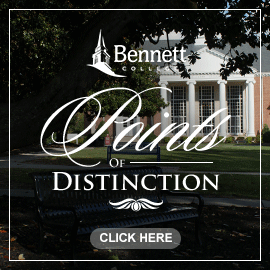 Registration as it relates to Bennett College: the following procedures must be completed in a satisfactory manner in order for a student to be classified as officially enrolled for a designated term. Must have completed Early Registration the previous semester. Business Office and/or Financial Aid for completion of the Early Registration Process. Completing Early Registration you are not required to return until the 1st Day of class (no fee will be imposed). Enrollment is completed for a student to proceed to class when the above Check‐in stations are successfully cleared and an electronically validated identification card is issued or updated. Meet individually with faculty advisors to arrange and complete Course Registration and/or proceed to BELLENET for online registration. (12 hours or more for fulltime) Your course will sit in “Reserve” until your advisor view and approve. Proceed to the Check‐in site (see below) for completion of the enrollment process (validation). Enrollment is completed for a student to proceed to class when all of the above Check‐in stations are successfully cleared and an electronically validated identification card is issued or updated. A student can neither register for the second semester of a sequential course in which she has received a failing grade in the prior semester, nor enroll in a course without successfully completing prerequisites. Bennett College has authorized the National Student Clearinghouse to provide transcript ordering via the web. You can order transcripts using any major credit card (or debit card with Visa/MasterCard logo). Your card will only be charged after your order has been completed. Select Bennett College from the drop down menu.